Located on the plains of La Mancha, in a setting which offers the appropriate conditions for open-air activities, the Parador offers the traveller all the privileges necessary to enjoy a peaceful, relaxed stay. The garden and the swimming pool create an atmosphere which invites you to rest, to stroll or to have a refreshing dip on warm summer evenings. This La Mancha country house, with its attractive corridor, is characterized on the inside by an elegant simplicity, where the natural light acquires prominence. Large windows and immaculate wood combine with the luminosity of comfortable bedrooms. 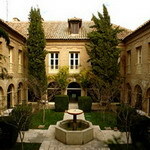 The Convent of San Francisco, built by the Dávila de la Cueva family in 1596, is located in a historical-artistic position of great interest, which offers the traveller the opportunity to discover the most beautiful parts of this town and the natural spaces surrounding it, among which stand out the Tablas de Daimiel. The inner rooms are welcoming with an elegant, peaceful air, with the 14 inner courtyards, the splendid garden and the swimming pool standing out from the ensemble. 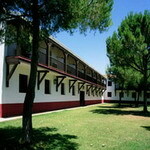 The bedrooms, installed in the former monastic cells, also offer peace and quiet. Beautiful galleries, wood and latticework complete the inner atmosphere. This Parador is located in a La Mancha style country house in Manzanares, between three of the most beautiful nature reserves of the country: Cabañeros, the Ruidera Lagoons and the Tablas de Daimiel. Trees, shrubs, gardens and plants fill the space with green, and, along with its swimming pool, make it a very desirable spot in the La Mancha landscape. The common rooms and bedrooms have wooden furniture, leather chairs and wrought iron wall lights, which contribute to an affable and friendly atmosphere. The former convent of San Pablo occupies a privileged position in the Hoz del Huécar gorge, a compendium of sheer walls and luxuriant vegetation on the outskirts of Cuenca, next to the 'Casas Colgadas' (Suspended Houses). The glazed cloister, and the former chapel, now an inviting café, complement an interior which combines traditional elements with more contemporary details such as wicker, leather and upholstery. The comfortable, welcoming bedrooms stand out, some of which have splendid views of the 'Casas Colgadas'. 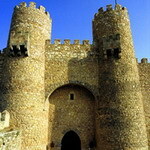 This castle of S. VIII, authentic medieval fortress, is based in a meander of the Júcar river, on a promontory in you are contiguous manchego-levantinas. The architecture of the Parador, which occupies the medieval castle of the Marquises of Villena, is the result of more than three centuries of history. Regal oak wood and a mix of modern and classic have made this a new Parador, where the fabrics accentuate its medieval character. The use of reds and oranges contrasts with the sobriety of the space, and serves to frame a true collection of paintings which echoes the famous museum of abstract art in Cuenca. 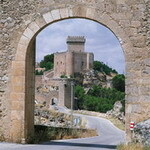 Tapies, Redondela, Sempere, Amadeo Gabino, Alvaro Delgado, Martínez Novillo and Menchu Gal are just some of the painters whose work decorates the former Castle of the Marquises of Villena, a peaceful refuge on the Castilian plateau. Installed in an Arabic citadel, which was constructed on a Roman settlement, construction on this imposing castle began in 1123, and was the residence of bishops, cardinals and kings. 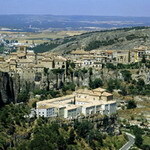 It is a suitable location to enjoy this historical town, close to very beautiful natural spaces. The traditional Castilian furniture is displayed with taste in the spacious, friendly bedrooms, some with four poster beds and terrace, genuine royal chambers in a palace which conserves stately living rooms, ideal for meetings and celebrations, and a 13th c. Romanesque chapel. Founded by the Lords of Chinchón in the 17th c., this former Augustinian convent protects its monumental heritage in that of the old quarter of Chinchón, with its emblematic Plaza Mayor. In this framework, the cypress trees, roses and privets of the garden offer a beautiful picture, with the addition of a splendid cloister and softened by the blue of its swimming pool. Walls with a Renaissance stamp, large windows and vaults, classical and Castilian style furniture, and its pleasant, spacious bedrooms make up the inner space, which is characterized by an atmosphere of peace and quiet. Located on the Cerro del Emperador by a meander of the river Tagus, this Parador offers an incomparable panoramic view of the monumental profile of Toledo, with its most precious jewels, such as the cathedral, the Alcázar (fortress) and the synagogues. 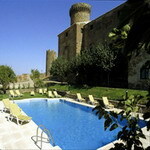 The Parador also offers the possibility to enjoy its refreshing swimming pool and to plan outdoor activities. From the bedrooms, living rooms, terrace and swimming pool can be seen beautiful views of the Imperial City, while the interior stands out for its spaciousness and luxurious facilities. Comfortable furniture is included with wooden beams, staircases and banisters and Mudejar elements on rugs and tiling. The ancestral home of the Álvarez family of Toledo, the Counts of Oropesa, which was a refuge for soldiers, monks and nobles in other times, offers exceptional panoramic views of the Gredos mountain range. 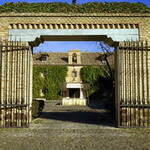 The historical value of the Keep backing on to the Parador, the columns and arcades of the courtyard, and the swimming pool, with exceptional views of the flat lands of the Campo Arañuelo, form a very attractive whole. Lamps, large chests and curtains dominate the interior decoration, in which the spaciousness and brightness of the bedrooms and the working and leisure rooms stands out.